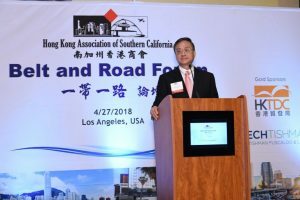 On Friday, April 27, 2018, the Hong Kong Association of Southern California hosted a business forum addressing the Belt and Road Initiative (BRI) advocated by the Government of China. 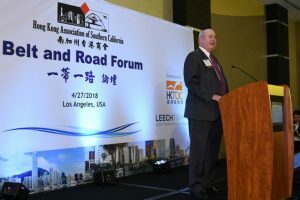 The Forum, which featured a keynote addressing the importance of overland, over-water and digital connectivity and commerce among the 80 participant countries by Ambassador Zhang Ping, China’s Consul General in Los Angeles, also featured an address by Leech Tishman corporate, construction and international practice partner William F. Bresee, covering approaches to risk consideration, risk management and transactional contract structure for international infrastructure projects. After the formal presentations, Bill joined other speakers in a more informal roundtable discussing topical matters and addressing questions from the Forum’s attendees. 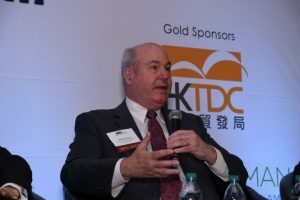 Bill commented, “This event featured presentations on the ideas, insights and development related to China’s BRI, both in terms of infrastructure and digital connectivity and global economic development, and transferred important knowledge on how U.S. companies can take advantage of the related opportunities and trends in other countries.” Attendees gained an understanding of the emerging opportunities in the Greater Bay Area of Hong Kong, Macao, and Guangdong, and had the opportunity to network with the speakers and contacts from Hong Kong’s government and businesses and others involved in matters related to the BRI. 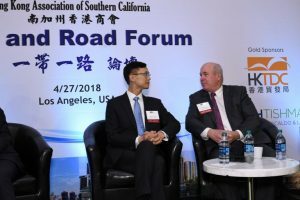 The Belt and Road Initiative, an infrastructure development strategy proposed and advocated by the Chinese government , focuses on connectivity and cooperation between Eurasian countries, through the land-based Silk Road Economic Belt (SREB) and the trans-ocean Maritime Silk Road (MSR), and is a visionary blueprint that seeks to enhance global economic development and reinvigorate the seamless flow of capital, goods and services by promoting international connectivity and forging new ties among communities. Although China has repeatedly presented it as an initiative for Asia, Europe, and Africa, which is also the way most Western observers perceive it, in 2017 the BRI went truly global as part of a cultural and economic foreign policy strategy through which China aims to leverage its position as a leading economic power. Danton K. Mak, Partner at Leech Tishman and President of the HKASC, speaking at the event. 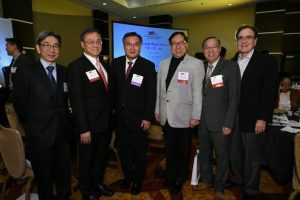 Leech Tishman Partner Danton K. Mak (second from the left) meets with HKASC leadership and members. Hong Kong Economic and Trade Officer Ivanhoe Chang (left) and Leech Tishman Partner William F. Bresee (right). Leech Tishman Partner William F. Bresee discusses legal considerations for international infrastructure projects. Leech Tishman Partner William F. Bresee speaking at the event. 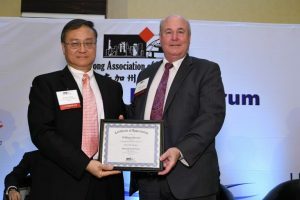 Danton K. Mak, President of the HKASC and Leech Tishman partner, presents Partner William F. Bresee with a Certificate of Appreciation for being an Honorable Speaker at the Belt and Road Forum.